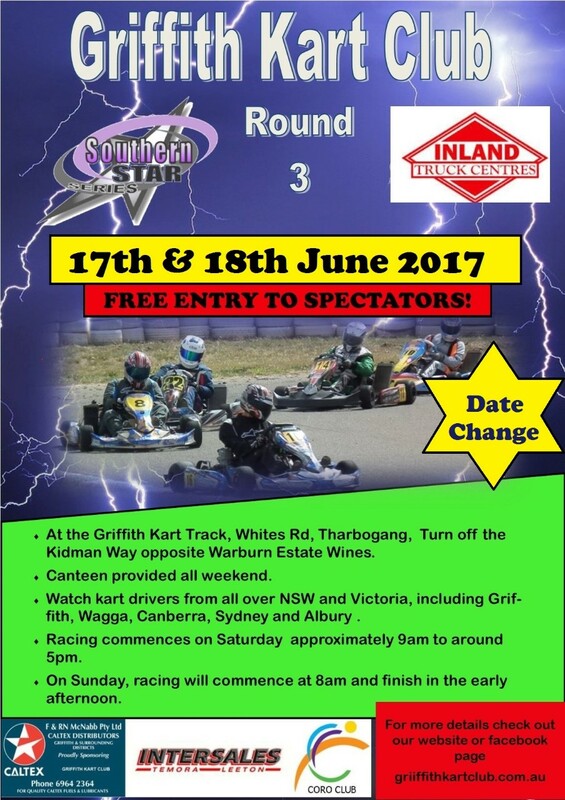 Griffith Kart Club is excited to host Round 3 of the 2017 Southern Star Series zone championships this June 17 & 11 2018. This is round three of a five round series held across southern the zone for 2017. So far Wagga Wagga has hosted round 1 and Orange round 2. We are looking forward to more action as fields for the two previous rounds have exceeded 100 competitors. The Griffith Kart Club had to apply for a date change for the event. It was to be held on June 10/11 however with a shortage of accommodation in Griffith due to the June long weekend activities in the city the race dates have been revised to June 17 & 18 2017. The Griffith Kart Club encourages all racers to some and compete at the Griffith Race Circuit, Whites road, Tharbogang. The track is smooth and fast with a balance of high speeds and technically challenging sectors that will test all karters at all levels. The track will have free camping available Friday and Saturday nights with amenities on site (no powered sites).Hot food and drinks will be on-site all weekend as the legendary GKC Canteen will be in operation. If you are new to competing in the Southern Star Series you can find our more information here.